Property 2: Superb house 100m² + 70m² terrace. Residence on the beach, sea view, pool. 6 persons-3 bedrooms- Wi-Fi - !!! Very child friendly house. Property 14: 6 persons-3 bedrooms- Wi-Fi - !!! Very child friendly house. Cozy apartment on the ground floor in a community with large pool and garden. Property 26: Cozy apartment on the ground floor in a community with large pool and garden. 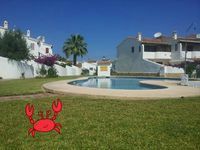 Property 30: House with garden, near the beach, internet, air conditioning, family friendly, pet willk. HOUSE 7persons for rent near the Mediterranean Sea (Costa Blanca). Property 33: HOUSE 7persons for rent near the Mediterranean Sea (Costa Blanca). detached, garden, parking, air conditioning, conservatory, fenced. Property 37: detached, garden, parking, air conditioning, conservatory, fenced. You'll be living like in God's pocket. Property 39: You'll be living like in God's pocket.